Macon Reed, "A Pressing Conference." Curated by Helen Toomer. 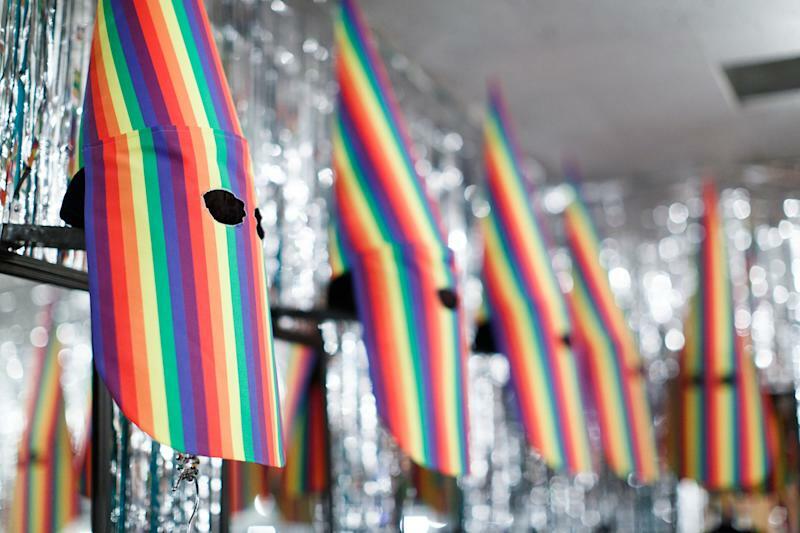 It’s a fitting theme, not only given thecurrent political climate― in which American leaders fervently cast perceived“outsiders” as suspect― but also the role Spring Break has come to occupy in the New York art fair landscape. At seven years old, the scrappiest, most experimental of the fairs feels like the new guy in town, kicking down the saloon door, raising eyebrows and inciting excited whispers. Amid a sea of more established, buttoned-up fairs open to cultured New Yorkers with deep pockets this month ― Armory Show, Volta NY, Independent, NADA ― Spring Break is the rebellious cowboy still managing to shake up the status quo. Fall On Your Sword, "Hard or Soft Option." Curated by Ambre Kelly and Andrew Gori. Filmmaker Andrew Gori and artist Ambre Kelly, the founders of Spring Break, lifted this year’s curatorial theme from a quote attributed to Leo Tolstoy, although perhaps falsely: “All great literature is one of two stories; a hero goes on a journey or a stranger comes to town.” Gori and Kelly appreciated the many ways the core idea of “a stranger” could be interpreted and explored ― from immigration to gentrification, science fiction to monster flicks. They officially announced the 2018 theme in September of last year, along with a list of recommended readings and films including James Baldwin’s Stranger in the Village and Ana Lily Amirpour’s ”A Girl Walks Home Alone at Night” ― “like homework” for contributors, Kelly told HuffPost. Over 450 hopeful curators submitted their ideas for potential exhibitor booths. Then, beginning in late November, Gori and Kelly pored over the submissions. ”We try not to look at any names,” Kelly said. “We make our decision based on the work.” Eventually they landed on the best 130 booths, featuring artists from Japan, Lagos, Algeria, Brazil and beyond. That this is all happening in a defunct office building, spread throughout abandoned cubicles, hallways, corner offices and snack rooms, adds an undertone of dystopian uncanny. 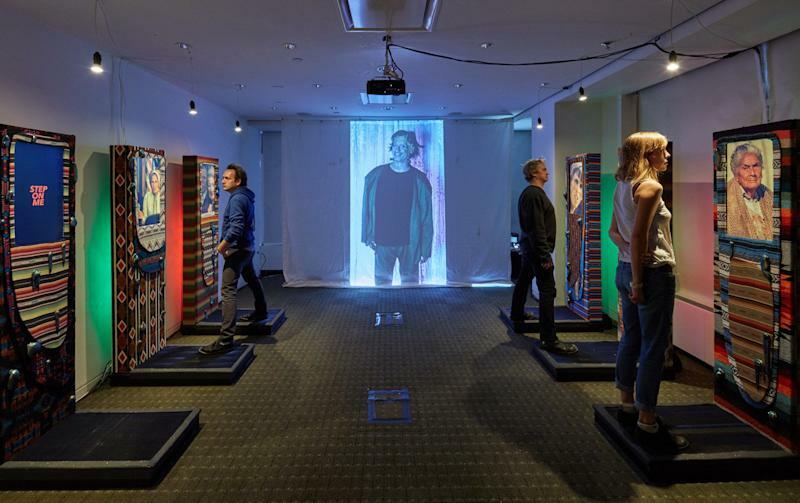 The curators, who hosted earlier Spring Break iterations in a former Catholic school and post office, are attracted to “former power structures,” Gori said, “or structures that still exist but have changed somehow.” Last year’s theme, “Black Mirror,” strongly toyed with the setting’s past corporate life. This year, the office space feels like the site of an invasion, its trappings hinting at former days of normalcy. When brainstorming potential themes for the show, Gori and Kelly kept returning to the fears and anxieties conjured by President Donald Trump’s rhetoric and its effect on the American ethos in particular. Obviously, current events have captivated the cultural imagination, but the art that follows sometimes fails to extend beyond catch-all ideas like “resistance” or “diversity,” so broad they’re at risk of seeming hollow and tokenizing. Gori and Andrew wanted to ensure that their theme prompted work that was as strong aesthetically as it was ideologically. Kawita Vatanajyankur, "Scales of Justice." Curated by Alexandra Fanning. Some offerings at the fair unmistakably reference the Trump administration. 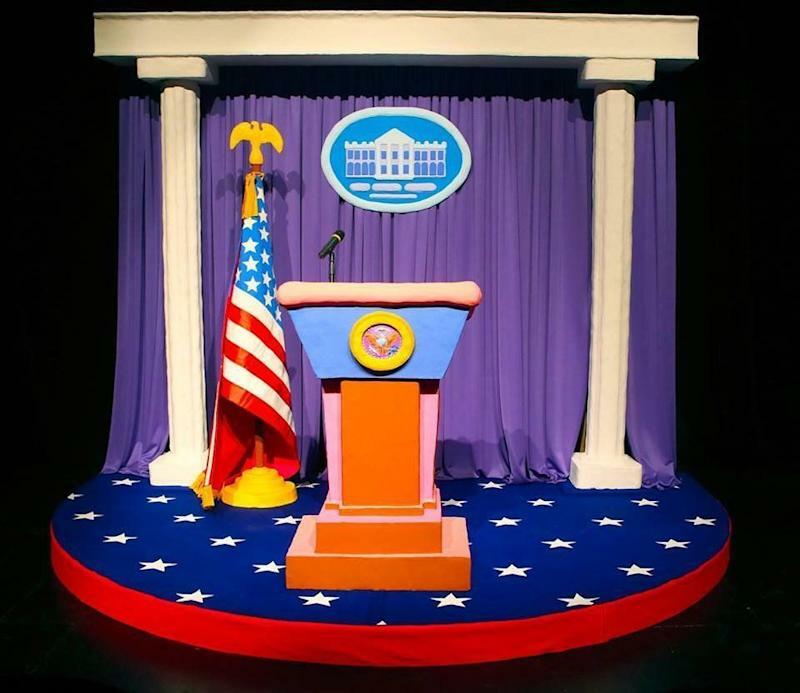 For example, artist Macon Reed’s fully realized re-creation of the White House press briefing room, replaces the traditional red, white and blue trifecta with soft pink tones that recall the set of a children’s television show. The rounded edges of the podium and presidential seal feel similarly child-proofed, perhaps poking fun at the maturity levels of those currently in office. One wonderful bonus of a show organized around “strangers” is that traditionally marginalized artists are in the center, not on the sidelines. In Kawita Vatanajyankur’s “Rituals of Otherness,” the Bangkok-based artist films herself enduring a variety of bizarre and physically taxing procedures, echoing the grueling labor sustained by women in Thailand and the physical impact it has on their bodies. In “The Basket,” a woman sits on a stool against a peach-colored backdrop, holding out a large, green wastebasket in her grip. After a few moments of unsettling silence, Vatanajyankur’s bound body shoots into the basket. Another standout artist is Kumasi Barnett, who alters vintage Marvel comic books with oil, acrylic, marker and pen to create an alternate series called “The Amazing Black Man.” The blistering books, preserved in plastic and laid out in a grid, address the overwhelming whiteness of comics history while retroactively updating the canon. Though many of the exhibitors tackle contemporary issues laced with anxiety and dread, the fair maintains a vibrant and even playful feel. There’s no shortage of current art trends, from day-glo neon palettes to faux fur. And some pieces, like Andy Harman’s super-sized velvet Cheetos, manage to feel both comforting and insulting (to a particular president, at least). Jeffrey Augustine Songco, "Society of 23's Locker Dressing Room." Curated by Marly Hammer + John Richey. March marks the kickoff of art fair season in New York, beginning with the Armory Show and ending with Frieze. Most of the fairs that set up shop in between feel unmistakably like highbrow trade shows ― set in white, billowy tents with prominently displayed price tags, where the primary objective is to sell work. This is precisely why Spring Break stands out. “We thought, what if art fairs were cohesive museum exhibitions with themes? But then you could take the artworks home with you,” Gori said. “We want you to walk into a room and have an experience with the art first, before thinking about price and value,” Kelly added. And while Spring Break still showcases big-name artists with high price tags, it intersperses the more established figures with emerging ones, yielding a delightfully discombobulating journey that can make both broke art students and blue chip collectors feel at home. Neither Kelly nor Gori have anything against the traditional art fair model, which they see as being in a “symbiotic relationship” with their more rebellious offshoot. Without the buzz of the big-name markets at Armory or Frieze, Spring Break probably wouldn’t attract visitors, they admit. After all, many of the Spring Break art installations look radically unsellable, from Cate Giordano’s papier-mâché rendition of a full-scale Roman bathhouse to Jeffrey Augustine Songco’s room-sized amalgamation of a sports locker room and backstage dressing room. Such pieces, which dare to eat up space no one has in their homes, seem to question the very idea of profitable artwork ― or that such a piece could end up in a private space. Kumasi J. Barnett, "The Amazing Black Man #164." Curated by Jac Lahav. Of course, since Spring Break’s 2011 debut, the gap between the unruly fair and its traditional predecessors has reduced. No longer the total outsider, Spring Break is now closer to a mainstay on the art fair circuit, subtly influencing the others in its midst. Kelly and Gori speak fondly of notable “strangers” who shook up the New York art scene upon arrival, from Andy Warhol and his factory to Jean-Michel Basquiat and his downtown circle. Many of Basquiat’s crew, including filmmaker Sarah Driver, are now part of the Spring Break community. And just like that, the boundary between inside and outside, newcomer and establishment, traditional and unorthodox, starts to blur. Andy Harman at Spring Break Art Show. Curated by Liz Collins. “Spring Break Art Show” runs from March 6-12, 2018 at 4 Times Square, NYC (Chashama). Entrance at 144 West 43rd Street. See more info here.